Jeannette and Harry Ayer moved to Mille Lacs in 1918, where they applied for and received a license by the Bureau of Indian Affairs to trade with the Indians at Vineland. In 1925, the Ayers built a store on the present location of the museum and trading post. Initially the trading post was operated as a general store, selling both food and non-food staples such as gasoline, cloth, and sewing supplies. In the late 1920s, the Ayers also added rental cottages, a dining room, and a boat-building business, and started guiding fishing expeditions. The Ayers employed a number of local band members. In 1929, when the boat-building business began, 18 Native men were working for the Ayers. The trading post and the additional businesses were a major part of the Mille Lacs economy and community. By the 1940s, the later businesses were dissolved and the trading post changed its merchandising plan. Capitalizing on the opportunity to acquire local Ojibwe craftworks and their location near Minnesota's Scenic Highway (now Hwy. 169) the Ayers prospered by selling Native American arts and crafts from throughout the United States. 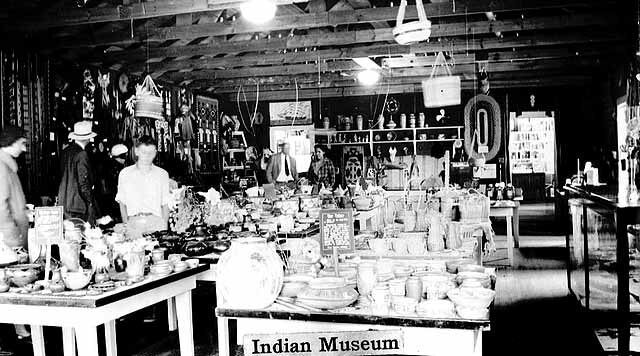 During this time, the Ayers kept a display of their personal collection of Indian-made objects in the back room of the store. In the late 1950s, they built a cinder-block museum to house the collection. In 1959, the Ayers retired and donated the collection, buildings, and land to the Minnesota Historical Society. In August 1960, the state opened the first Mille Lacs Indian Museum. In 1996, a new museum and restored trading post opened. Changes to the trading post included reinstalling the original south porch entrance, installing new windows to match historic locations, and restoring original interior finishes. Outside, signs and gas pumps recreate the 1930s roadside tourist stop. A small exhibit area located in the front of the trading post's sales room floor tells the history of the site and the original owners. Inside, visitors can shop for the region's finest handmade authentic Native products such as porcupine quill baskets and birch bark products as well as Pendleton blankets, dream catchers, jewelry, books, music, wild rice, and maple syrup. Contemporary artwork from some of the areas premier artists are also available. Artists-in-residence programs and Native art markets and traveling exhibits offer visitors an opportunity to learn more about the techniques and materials used in various art forms today. Indian Trading Post, Mille Lacs, around 1920. 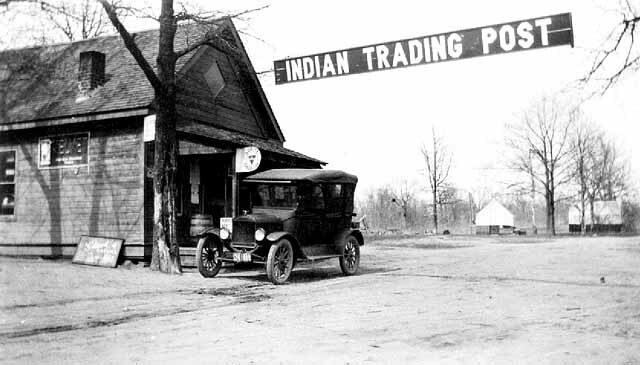 Indian Trading Post, Mille Lacs, around 1920. Source: MNHS Collections. Interior of Trading Post, showing Ojibwe and other Indian crafts for sale, 1935. Interior of Trading Post, showing Ojibwe and other Indian crafts for sale, 1935. Source: MNHS Collections. 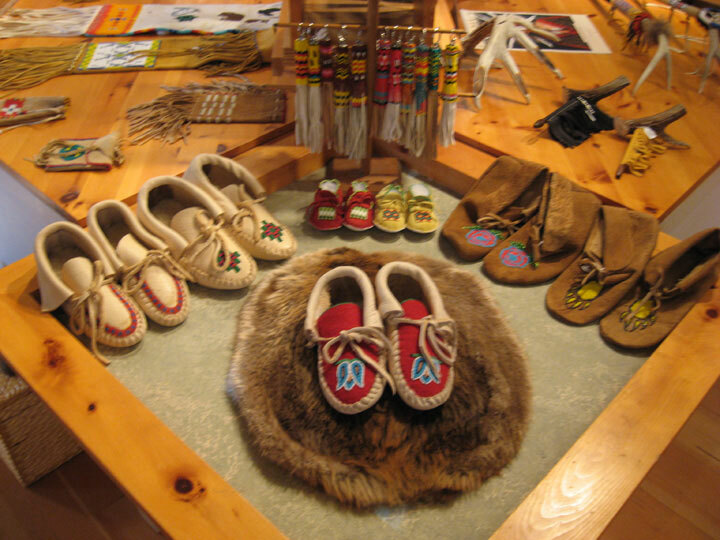 Indian crafts such as moccasins are available today at the Mille Lacs Trading Post.